For other uses, see Port Jackson (disambiguation). Port Jackson, consisting of the waters of Sydney Harbour, Middle Harbour, North Harbour and the Lane Cove and Parramatta Rivers, is the ria or natural harbour of Sydney, New South Wales, Australia. The harbour is an inlet of the Tasman Sea (part of the South Pacific Ocean). It is the location of the Sydney Opera House and Sydney Harbour Bridge. The location of the first European settlement and colony on the Australian mainland, Port Jackson has continued to play a key role in the history and development of Sydney. The land around Port Jackson was occupied at the time of the European arrival and colonisation by the Eora clans, including the Gadigal, Cammeraygal, and Wangal. The Gadigal occupied the land stretching along the south side of Port Jackson from what is now South Head, in an arc west to the present Darling Harbour. The Cammeraygal lived on the northern side of the harbour. The area along the southern banks of the Parramatta River to Rose Hill belonged to the Wangal. The Eora occupied Port Jackson (Sydney Harbour), south to the Georges River and west to Parramatta. The first recorded European discovery of Sydney Harbour was by Lieutenant James Cook in 1770. Cook named the inlet after Sir George Jackson, one of the Lord Commissioners of the British Admiralty, and Judge Advocate of the Fleet. As the Endeavour sailed past the entrance at Sydney Heads, Cook wrote in his journal "at noon we were...about 2 or 3 miles from the land and abrest of a bay or harbour within there appeared to be a safe anchorage which I called Port Jackson." No-one on the ship recorded seeing any of the Harbour's many islands. This would have been because their line of sight was blocked by the high promontories of South Head and Bradleys Head that shape its dog-leg entrance. However, these islands were known to Captain Arthur Phillip, the First Fleet commander, before he departed England in 1787. Seemingly, Cook had seen the main body of the Harbour in 1770 and, on returning home, he had reported his important discovery to the Admiralty. An explanation of Cook's discovery was first proposed in the book Lying for the Admiralty (2018). While the Endeavour was anchored in Botany Bay, Cook may have followed one of the ancient Aboriginal tracks that connect Botany Bay to Port Jackson, a distance of some ten kilometres. The Admiralty had ordered Cook to conceal strategically valuable discoveries, so he omitted the main Harbour from his journal and chart. —  Governor Arthur Phillip, 15 May 1788. The Harbour as seen aloft from Tasman Sea. Geologically, Port Jackson is a drowned river valley, or ria. It is 19 km long with an area of 55 km2. The estuary's volume at high tide is 562 million cubic metres. The perimeter of the estuary is 317 kilometres. Permanent cruise ship terminals are located at the Overseas Passenger Terminal at Circular Quay, Sydney Cove and at the White Bay Cruise Terminal at White Bay. White Bay's evolution to a cruise terminal came with the closure of Darling Harbour terminal to make way for the Barangaroo development. Sydney Ferries operate services from Circular Quay to Manly, Mosman, Taronga Zoo, Watsons Bay, Rose Bay, Barangaroo, Balmain, Parramatta, Milsons Point and other destinations. Port Jackson is associated with the voyages of Richard Siddins. A Sydharb is a unit of volume used in Australia for water. One sydharb (or sydarb), also called a Sydney Harbour, is the amount of water in the Sydney Harbour (Port Jackson): approximately 500 gigalitres (410,000 acre⋅ft). Sydney Harbour in distance as seen aloft from Tasman Sea, overlooking the clifftop suburb of Vaucluse. East Channel Marker in Sydney Harbour, colloquially called the East Wedding Cake. ^ "Sydney Harbour National Park". NSW National Parks. ^ McDermott, Peter Joseph (6 November 1878). "Pacific Exploration". The Brisbane Courier. Brisbane Newspaper Company Ltd. p. 5. Retrieved 5 November 2008. ^ Phillip, Arthur (11 April 1787). Comments on a draft of his instructions. TNA CO 201/2, f.128–131. ^ Frost, Alan (1987). Arthur Phillip, 1738–1814: His Voyaging. Melbourne: Oxford University Press. p. 296, n.3. ISBN 0195547012. ^ Cameron-Asn, M. (2018). Lying for the Admiralty:Captain Cook's Endeavour Voyage. Sydney: Rosenberg. ISBN 9780648043966. ^ Cameron-Asn, M. (2018). Lying for the Admiralty:Captain Cook's Endeavour Voyage. Sydney: Rosenberg. p. 167-175. ISBN 9780648043966. ^ Champion, Shelagh; Champion, George (1990). "Phillip's First Three Days in Port Jackson: 21st, 22nd and 23rd January 1788". Manly, Warringah and Pittwater: First Fleet Records of Events, 1788–1790 (September 2005 revised ed.). Killarney Heights. ISBN 0-9596484-3-7. Archived from the original (PDF) on 10 July 2017. ^ "Letter from Governor Phillip to Lord Sydney (15 May 1788)". Historical Records of New South Wales. Vol 1, Part 2 (1783–1792). Charles Potter, Government Printer. 1892. p. 122. ^ Office of Environment and Heritage. "M24 Japanese Midget Submarine wreck site". State Heritage Inventory Database. Retrieved 28 October 2018. ^ Grose, Peter (2007). 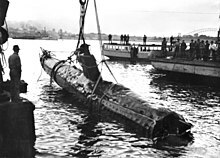 A Very Rude Awakening: The night the Japanese midget subs came to Sydney Harbour. Allen & Unwin. ISBN 9781741752199. ^ a b Royal Australian Navy. "RAN Heritage Centre". Retrieved 28 October 2018. ^ "DECC – Defence heritage in and around Sydney Harbour". ^ "Port Jackson". Geographical Names Register (GNR) of NSW. Geographical Names Board of New South Wales. Retrieved 3 August 2013. ^ McNab, Heather (11 January 2017). "Twin tunnels under Sydney Harbour given green light for metro project". Daily Telegraph. News Corp. Retrieved 18 January 2017. ^ a b "Sydney Ports". ^ "Fort Denison". New South Wales State Heritage Register. Office of Environment and Heritage. H00985. Retrieved 18 May 2018. ^ "Goat Island". New South Wales State Heritage Register. Office of Environment and Heritage. H00989. Retrieved 18 May 2018. ^ "South Steyne (S.S.)". New South Wales State Heritage Register. Office of Environment and Heritage. H00755. Retrieved 18 May 2018. ^ "Australian Conventional Units of Measurement in Water" (PDF). Australian Water Association. Archived from the original (PDF) on 30 October 2005. Retrieved 10 March 2006. Wikimedia Commons has media related to Sydney Harbour (Port Jackson) and Sydney Harbour National Park. ABC Radio National: "A Living Harbour" – a history of Sydney Harbour. Office of Environment and Heritage. "Sydney Harbour and Parramatta River catchment" (map). Government of New South Wales. Sydney Harbour Federation Trust – established by the Australian Government to plan for the future of former Defence and other special Commonwealth Lands around Sydney Harbour.